If you are interested in building a homestead or want to live as well as possible while all the world is falling apart, you’ll have to face the challenge of sewage and waste disposal. On the other hand, there are so many pollutants in the air, ground, and water, that you will need a way to manage harmful toxins and chemicals on your own. Biofilters can be used to manage these and other problems. Do you know what to be aware of when buying a biofilter? Here’s what you should know before any acquisition. Keep reading! If you have ever kept an aquarium or fish pond, then you may already be acquainted with the concept of a biofilter. Basically, these filters rely partly on mechanical media to remove debris, toxic gasses, and other pollutants from a surrounding substance that is pumped through the media. The filter media is also used as a growing place for bacteria that can break down even more chemicals and turn them into something less dangerous. For example, in an aquarium or pond, nitrifying bacteria break down ammonia excreted by fish and turn it into nitrates. The nitrates, in turn, are used by plants which release oxygen into the water. Modern biofilters for aquariums and ponds still rely on the same bacteria to keep the water clean and in as good a condition as possible for the fish living in it. Other biofilters are emerging to take care of many other needs. Some use other kinds of bacteria, while others use fungi and other micro organisms. Since different chemicals and molecules require different micro-organisms to break them down, you will find that each filter has a specific purpose and may not be usable for other applications. This proven-to-work portable device which provides clean fresh water 24/7! Basically, a biofilter can break down or “clean” just about anything that can be metabolized by the micro organisms living in the filter. Many are only available to businesses, government, or other commercial consumers, but biofilters for different purposes are making their way to the masses. Bacteria that break down sludge and sewage – these biofilters are available to consumers at all levels. For example, you can buy sludge removers for drains as well as for septic systems. There are also composting toilets available that utilize these kinds of bacteria. Bacteria used in hydroponics, ponds, and aquarium systems – you get these bacteria “for free” along with any fish you might buy, and there are also jump start bacteria that you can use to establish them even faster in a new aquarium or hydroponic setup. In addition, there are newer and more powerful biofilter/pump systems arriving on the market that take even more advantage of these filters to accommodate larger aquariums and volumes of water. Bacteria that break down plastics – these bacteria are very important for dealing with plastic waste that you don’t want to bury or have leaching into the soil. These bacteria and appropriate media are not readily available to the public, but you can expect to see these devices making their way onto the market as the technology gets cheaper. Bacteria and fungi that break down volatile organic compounds – these biofilters are not widely available. They are designed, however, to break down paints and toxic gaseous pollutants in the air. You may not be able to buy a biofilter for air filtration, but you could make your own. In this case, you can make a fairly large on using a fan to move contaminated air into a pipe that leads under a bed of peat, wood chips, straw, or other appropriate media. Today, these filters are being used on commercial farms that are located near residential areas affected by the odor from animals living on the farms. You can also build a similar system for a homestead, especially if you are going to keep large animals in a relatively small or enclosed area. You can still use the same fan and pipe arrangement for pushing contaminated air into a location where it will be exposed to the micro organisms in the filter. Other filters for water, or mud (soil that has been liquefied enough to pass through the filter). Even though these filters may not be readily available, you can still get pumps that will move thick mud or sludge around. From there, you may devise your own screens and media, as you would for making a biofilter for the air. Bacteria that break down radioactive materials – these bacteria are still being studied and researched to see if they can be used to manage nuclear waste sites as well as other locations that need to be cleaned up. Sadly, while many people are at risk from exposure to nuclear radiation and debris, it is not likely that appropriate bacteria and filter systems will be made available to the public anytime soon. Since these bacteria are also rare and notoriously difficult to find, it may not be possible to obtain them from natural settings. Consider the power and durability of the pump that will be used to take the contaminated materials and move them through the filter media. A weak pump will not work as quickly, and may also burn out as the media fills up or begins to clog from debris buildup. Overall, the stronger the motor, the better it will be. Even if you push the filter to its maximum limit, a stronger motor gives you room to expand as well as reduce the risk of break downs. Filter size is also important. Larger filters media beds can accommodate more bacteria and also process more material at one time. This reduces the speed at which clogs will develop. A larger filter surface are can also reduce impact on the pump and filter because it has more area to pull a “smaller” amount of material through. When people hear about biofilters, they often start off by thinking that the filter should never, or rarely need cleaning. For example, in an aquarium filter using floss, you may even have been told that the floss only needs to be rinsed from time to time. While some filters last for a long time without clogging, others need a bit more care. In fact, if you don’t clean a biofilter, the clogging can easily damage the pump and motor as well as kill off the organisms that you need for breaking down toxins. Since you will also need to avoid killing off the bacteria or fungi employed while cleaning the filter, ease of maintenance is important. Most filters on the market today use drop in cartridges or screens that can be rinsed out, but they can also be quite messy to work with, especially if they have been immersed in water or mud. Take the time to look at the filter schematics before you buy. If a floor model is available, find out if you can test assemble and disassemble a unit to see how you feel about it. There are few things worse than trying to install new filter media when the clamps get stuck, or some vital part is stuck in a place that is hard to see or reach. Spend a bit more on a filter that is easy to care for than a cheaper one that is harder to maintain. Is it Possible to DIY Replacements and Repairs? Some biofilters have flexible media, while others require special cartridges that cannot be substituted. For example, if you are considering buying a biofilter for a pond, it may require special cartridges that cannot be rebuilt or substituted with something that you make yourself. Other filters have non-DIY cartridges because the media the micro organisms grow on may not be readily available at the consumer level. Some may require special plastic films, while others may only grow in special chemical solutions that are housed maintained in some kind of ceramic matrix. Either way, this can pose a problem for off gridders and preppers that want to be completely sufficient. It can also pose a problem for anyone that buys a system, and then find out that they can no longer obtain filters for a unit that still works perfectly in every other way. These are just a few reasons why you should shop around for a filter that you can make replacement cartridges for if needed. If you do some research on biofilters, you will find out that some are fairly easy to make. Let’s say you want to use a biofilter to process pond water. As you browse through listings for these devices, you may find there are several dozen models on the market, each with a different size cartridge. When building your own system, you can always find a motor and pump that will match the models you are looking at, and then build a canister that will accommodate multiple sized filter cartridges. Even if building a custom canister doesn’t save you money, at least you will still be able to keep the system going even if the preferred cartridges are not available. In this case, a custom canister can also be of immense help if you want to make sure you can use alternative media. For example, there is no such thing as an aquarium, pond, or hydroponics filter that can’t use floss fiber or a sponge as the supporting material for nitrifying bacteria. Even if you have to fold up old fabric or loosely woven sari cloth, it can be used as a matrix for the bacteria. You can also use prefilters featuring tighter or looser weaves so that you disrupt as little bacteria as possible when you need to change these filters. No matter how careful you are about choosing durable biofilter with a good quality motor and pump, eventually it will fail. Under these circumstances, you are best served by having a filter that has a pump and motor in an easily accessible location. If you can’t do the repairs yourself, look for a filter with a bit more flexibility, able to swap out different motors and pumps and still have them fit in the casing. Electric pumps and motors are very convenient devices, and when it comes to household current usage, they can also take quite a bit of current: the larger and stronger the device, the more power it will need. for pumping water you can use an Archimedes screw or a ram pump. 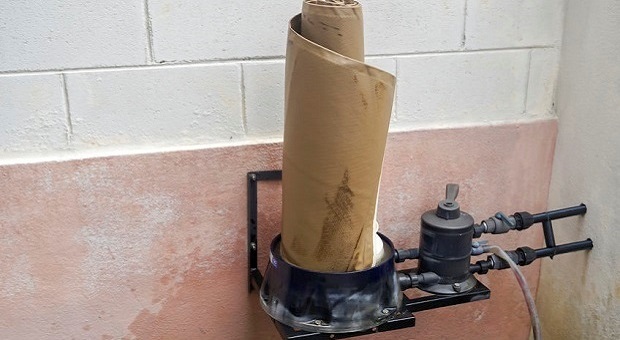 You’ll need larger or more loosely packed filters and then let the water drain down into a catching receptacle before feeding it back into a pipe for use in the house. Instead of using electric fans to push air into a filter, try gravity fans. If you must process large amounts of mud or sewage, choose either a water wheel or some other device that can operate a non-electrical pump. Depending on the devices you have at hand, you could generate small amounts of electricity. Instead of powering one large device, build networks of smaller systems able to effectively use the power you have at hand. 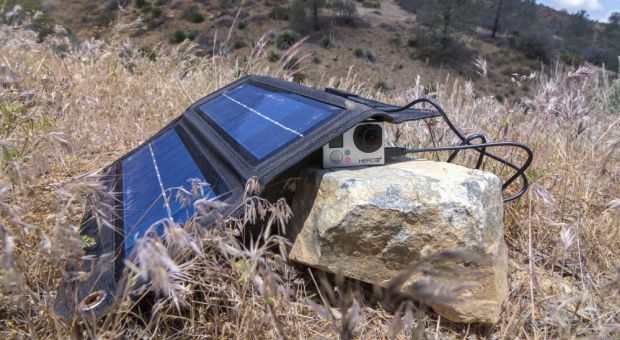 Let’s say you can generate 12 volts of power with a solar backpack or some DIY solar system. Let’s also say you have built 4 of them, and can easily build several more. Rather than try to operate one large fan, pump or motor, focus on smaller motors that can run on what you have. From there, you may need to make smaller filters and clean them more often, however they will still get the job done. As more people become interested in prepping and off gridding, biofilters are also emerging as a technology of interest. Whatever you need to clean – clean water, air, or soil, biofilters could be the solution. Just remember that each item you want to clean may require a different filter because each toxin you need to break down may require a different micro organism that has specific growth requirements. Having a wide range of biofilters onhand and knowing how to choose the proper one will help you a lot. You need clean water, so be sure you’ll be able to provide it for you and your family! I notice by your bio that you are already a off-grid homesteader. it SURPRISES me that you would be advocating hydroponics; as most off-grid HOMESTEADERS DISDAIN this sort of system. as a missionary to haiti, i was aware of a bio-sand filter system that was used in individual homes to purify water. these filters did a very great job of providing clean water where in, haiti, there is non AVAILABLE NATURALLY. these filters are very easy to construct and maintain. Here is a link to an organization building and PROVIDING training for these filters to families in haiti. W O W ! Carmela . . . This is, without a doubt, the best article on this subject that i have seen ! many of us will benefit greatly from your effort and i could not say thank you enough. one thought for you : some organic toxins will disable any filter fairly quickly – only time and experience will tell.how much and how soon. thank you !